The M12 FUEL 1/4" Hex 2-speed Screwdriver Kit delivers longer productivity in a compact size. 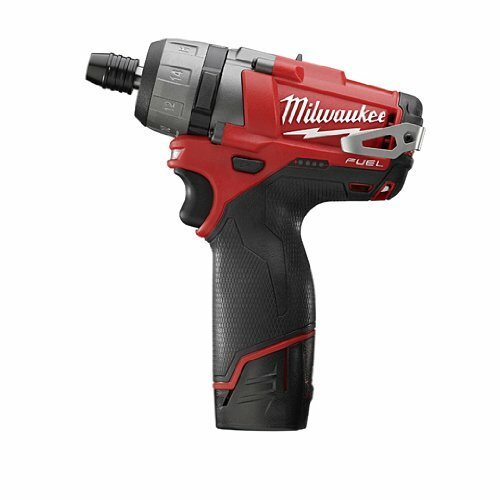 This 2-speed screwdriver provides up to 10X longer motor life, 2X more power, and 2X more run time. The POWERSTATE Brushless Motor outperforms all leading competitors with constant power output, yet runs cooler with no wearable components. The REDLITHIUM 2.0 Battery Pack delivers up to 20% more power and 2X more recharges than standard lithium-ion batteries, as well as best-in-class performance in extreme job site conditions. The onboard fuel gauge helps you monitor the charge more accurately, so there’s less downtime on the job. REDLINK PLUS intelligence ensures maximum performance and protection from overload, overheating and over-discharge. The M12 FUEL 1/4" Hex 2-speed Screwdriver’s optimized design results in superior speed for greater productivity on the jobsite. Its compact size allows users to work in tight spaces. The built-in LED worklight illuminates work surfaces in dark work spots.